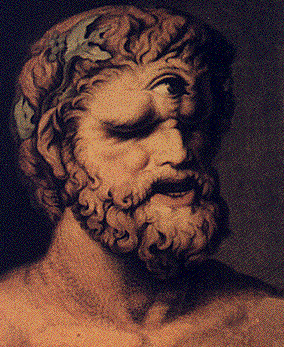 A Cyclops is a member of the Greco-mythical race of giants with a single eye in the middle of their forehead. The word means round eye. There were two generations of Cyclopes. These Cyclopes were the children of Uranus and Gaia. 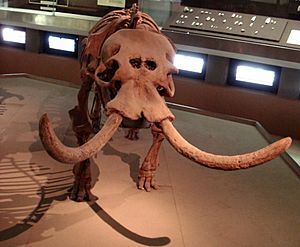 They were giants with a single eye in the middle of their forehead and a foul disposition. According to Hesiod, they were strong, stubborn, and "abrupt of emotion". Their names eventually became synonyms for strength and power, and were used to signify especially well crafted weapons. There were three: Brontes, Steropes and Arges. Uranus feared their strength and locked them in Tartarus. Later, Cronus, another son of Uranus and Gaia, freed the Cyclopes, along with the Hecatonchires and Gigantes. They fashioned lightning bolts for Zeus to use as a weapon and helped him overthrow Cronus and the other Titans. The thunderbolts which became Zeus' signature weapon were forged by all three Cyclopes: Arges added brightness, Brontes added thunder, and Steropes added lightning. These Cyclopes also created Poseidon's trident, Artemis' bow and arrow, and the helmet that Hades gave to Perseus on his quest to kill Medusa. 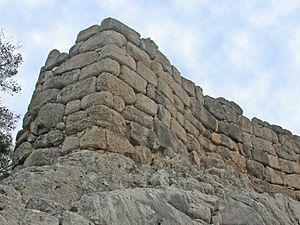 They were Hephaestus' helpers and are said to have built the fortifications at Tiryns and Mycenae in the Peloponnese. The noises proceeding from the heart of volcanoes were attributed to their operations. In Homer's Odyssey, a scouting party led by the Trojan War hero Odysseus lands on the Island of the Cyclopes and ventures upon a large cave. They enter into the cave and proceed to feast on some food they find there. Unknown to them, this cave is the home of Polyphemus who soon comes upon the trespassers and traps them in his cave. He proceeds to eat several crew members, but Odysseus devised a cunning plan for escape. 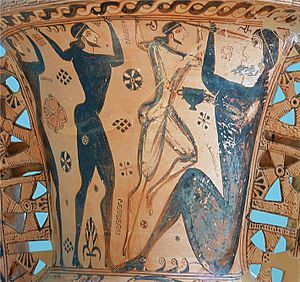 To make Polyphemus unwary, Odysseus gave him a barrel of very strong, unwatered wine. When Polyphemus asked for Odysseus' name, he told him that it was 'Outis', Greek for 'no man' or 'no one'. Once the giant fell asleep drunk, Odysseus and his men took a hardened spear and destroyed Polyphemus' only eye. Polyphemus' cries of help were ignored by fellow cyclopes on the island as he said that "No man has blinded me". In the morning, Odysseus tied his men and himself to the undersides of Polyphemus' sheep. When the Cyclops let the sheep out to graze, the men were carried out. Since Polyphemus was blinded, he didn't see the men, but felt the tops of his sheep to make sure the men weren't riding them. As he sailed away, Odysseus shouted his name and declared his own victory, incurring the wrath of Poseidon. From Greek cyclos, "circle" + ops, "eye". Given their penchant for blacksmithing, many scholars believe the legend of the Cyclopes arose from an actual practice wherein blacksmiths wore an eyepatch over one eye to prevent them from becoming blind in both eyes from flying sparks. Blacksmiths also tattooed themselves with concentric circles in honor of the sun; this is another possible source of the legend. After the "Dark Age" Hellenes looked with awe at the vast dressed blocks that had been used in Mycenaean masonry, at sites like Mycenae and Tiryns or on Cyprus, and they concluded that only the Cyclopes had the combination of skill and strength to build in such a monumental fashion. Cyclops Facts for Kids. Kiddle Encyclopedia.